In October 2006 in an old tribal home at Madagascar someone of the elder people told us about the development of the human race: “Here your feet are touching the cradle ground of mankind!” he said, “What terrible price this African race had to pay in ages just for being the first ones on this planet”. 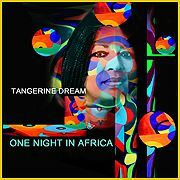 In that night the idea was born to compose a few songs for a TD Africa compilation. Not the typical ethnic acoustic material – there are others who did it much more authentically. “One Night In Africa” reflects the timeless atmosphere of those African spirits sprayed out over the globe in hundreds of years. TD wanted to pay a little tribute to the positive fact of their human existence and endless passion. Even during wars, the brutality and mindless behaviour of so-called civilized nations the people of this extraordinary continent have shown their willingness to forgive those who came second. Touch the ground yourself musically – it is your ground, your cradle as well. SHIPPING START: 23rd SEPTEMBER 2013!! !